Interesting Facts and information about the role of the Church in the Middle Ages. The power of the church in the Middles Ages and its influence on Medieval people. The Roman Catholic Church united all of the people that lived in Europe during the Middle Ages era. The Kings were dedicated to protecting the religion and the Roman Catholic church in the Middle Ages. All across the continent people made large contributions to the churches - they were expected to pay a 'tithe' of about 10%of their earnings. The church in the Middle Ages was totally exempt from paying taxes and the church became the most powerful institution in the world. Medieval people all believed in the concept of Heaven and Hell. The rise of Islam in the era and the fight for the possession of the sacred city of Jerusalem and the Holy Land led to the series of wars in the Middle Ages called the Crusades. 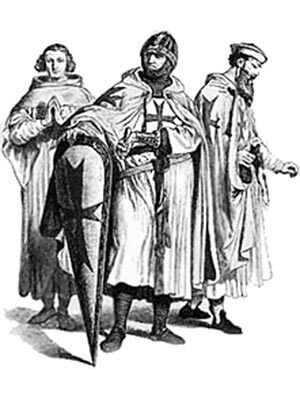 The Catholic Church encouraged the Kings, the knights and ordinary people to undertake the Crusades. They travelled thousands of miles to fight for the Christian religion and the Roman Catholic Church in the belief that this would earn them a remission of all their sins and a guaranteed entry into heaven. The Church in the Middle Ages led to the building of great churches and cathedrals across Europe. The magnificent Gothic architecture of the Middle Ages featured beautiful stained glass windows, great pointed arches and vaults, flying buttresses and hideous gargoyles, an ever-present reminder of the horrors of hell. There were no seats in the cathedrals and church of the Middle Ages. People were expected to stand throughout the service which was conducted in Latin. Ordinary people were unable to understand the words but were able to view the religious art that visually conveyed the teachings of the church via the images portrayed in the stained glass windows, and also the religious art conveyed in mosaics and frescoes. The Church in the Middle Ages maintained their power over all the countries and kings in Europe with the threat of excommunication. Excommunication from the church was in the power of the Pope - a great hold on the warring Kings and leaders of the era. The Catholic Church in the Middle Ages was therefore able to influence the kings and rulers of Europe with the threat of excommunication. Opposition to the Catholic Church and the pope would result in excommunication which they were banned from attending any church services, denied the sacraments and would go straight to hell when they died. The Popes in the Middle Ageshad authority over the kings which gave great power to the Roman Catholic church in the Middle Ages. The hierachy of the church was, like everything else in the Middle Ages, pyramid shaped. The Poe was the supreme power followed by the Cardinals, Archbishops, Bishops and Parish priests. In 1233 a church court, or Inquisition, was set up by Pope Gregory IX to end heresy. The Inquisition was greatly feared and the threat of the Inquisition increased the power of the Churches in the Middle Ages. The Church in the Middle Ages influenced the activities of Medieval people on a daily, weekly and monthly basis. Certain foods were allowed on specific days of the week. Prayers were made at specific times of the day. Everyone was expected to attend church on a Sunday, the day of rest. There were Religious Festivals in every month of the year. A feature of the Church in the Middle Ages was the large number of Convent and Monasteries. The nuns and monks worked for the good of the churches and also for the good of the community. The Monks and Nuns performed many works of charity by providing food for the hungry and help and medicines for the sick. Work was conducted on church-owned lands and the monks, and sometimes the nuns produced beautifully illuminated manuscripts of classical authors and religious works. Each section of this Middle Ages website addresses all topics and provides interesting facts and information about these great people and events in bygone Medieval times including Churches in the Middle Ages. The Sitemap provides full details of all of the information and facts provided about the fascinating subject of the Middle Ages!